This is a project that I remember doing as a kid. Take a beautiful fall day, some old clothes, and a pile of leaves and spend some time together as a family making a scarecrow. It was such a blast for all of us and it brought back some good old memories from my own childhood. 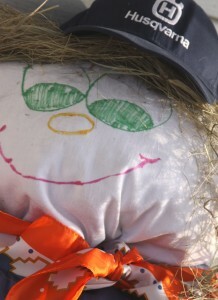 This is the first time that I have ever made a scarecrow with my kids. 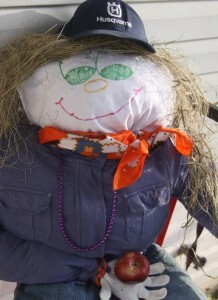 We were out raking up leaves in our yard on a most spectacular fall day when we got the idea to make a scarecrow. I walked out of the garage and spotted a tote of old clothes that I should have taken to Goodwill months ago that sparked this activity. 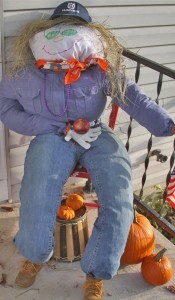 We used an old shirt and pair of pants from the tote to create “Grandma” Scarecrow. I tied the legs and arms of the pants and shirt closed with twine. You can use an kind of string that you have. Once the holes where close the kids started stuffing the leaves in to make the legs and body of our scarecrow. We used an old pillowcase stuffed with leaves for the head. I used permanent marker to make a very happy face onto the pillowcase. I wanted it to be kid friendly, and not the least bit scary. I stuck a long stick into the stuffed pillowcase and then tied the bottom closed (with the stick sticking out). The head was then set on top of the stuffed shirt with the stick pushed down in to keep the head from falling off. I then laid out a bunch of little accessories and let the kids choose what they wanted to add. They Wanted her to be a “Grandma” scarecrow so she got some fun accents. My Daughter added a purple necklace and a bright orange silk scarf. My son added some hay for hair and a very sharp looking hat. 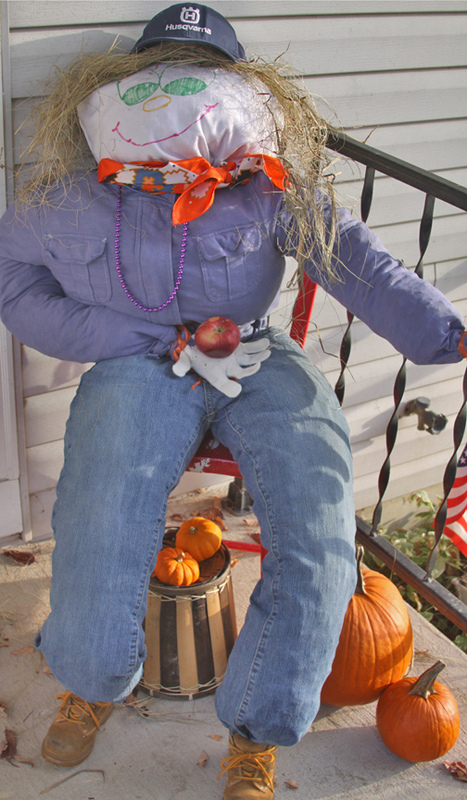 I used some cheap winter gloves for the hands and my son even went as far as to add an apple in Grandma scarecrow’s hand. We added some little worn work boots that my son outgrew for the feet. 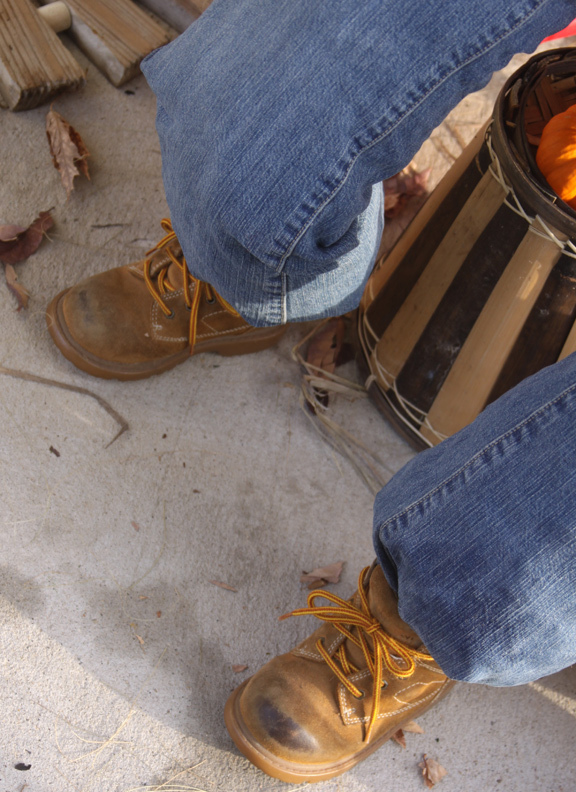 We just pushed the tied off end of the pants inside the boots to finish off her look. Do you think that they love their Grandma scarecrow or what? It is so adorable to hear them say goodby to her every time we leave the house. 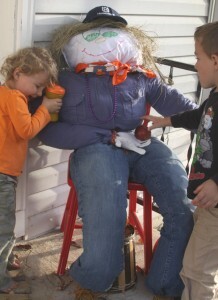 They are so proud of their scarecrow and show her to everyone that comes over. We had a great time making it and the kids thoroughly enjoyed being able to be the ones to create her by picking what to add. I hope you take a beautiful fall afternoon to do this simple, free, and classic fall activity with your kids. You will be so glad you did. Such a cute idea. We don’t have any fall leaves here, but when we vacation up in GA this year, I am bringing some old clothes. How fun! Thanks for posting.